Scalded Flea ...: Happy Birthday Al! Big day in the science community! It's Pi day AND Albert Einstein's birthday! 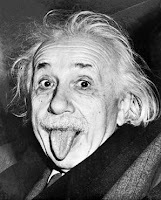 Everyone knows Albert Einstein is famous for deriving E=MC2. Einstein always fascinated me. As a teenager, I didn't put up posters of bands in my room. My ceiling was COVERED in posters of Albert Einstein. I used to lay in bed and just stare up at them. I found it amazing that someone could conceive of such amazing things.